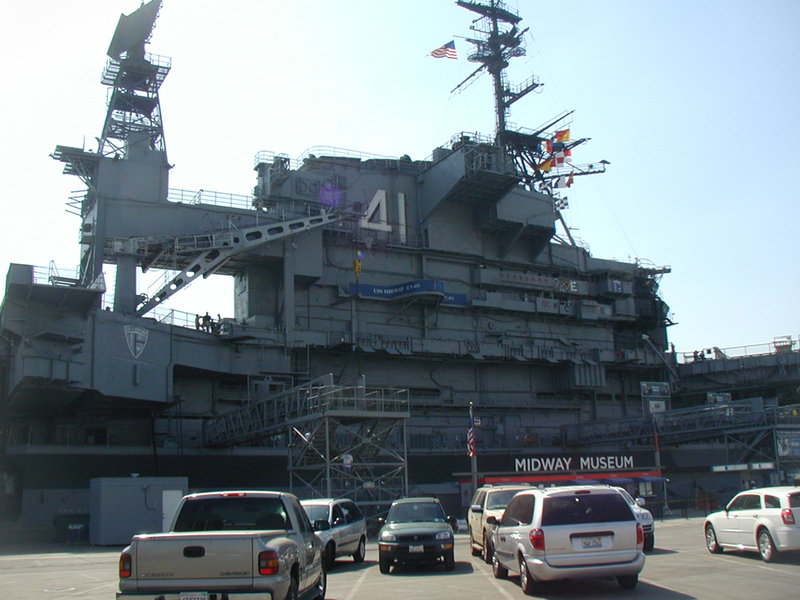 Designed and built during WWII as a successor the Essex class carriers, USS Midway wasn't commissioned until September 1945 - too late to see service during the war. 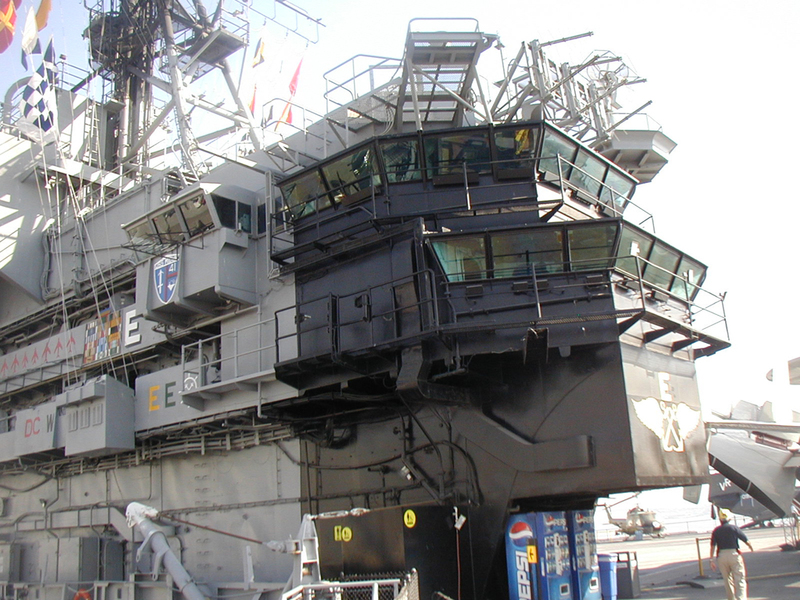 She later saw action during Korea, Vietnam, and the first Gulf War. 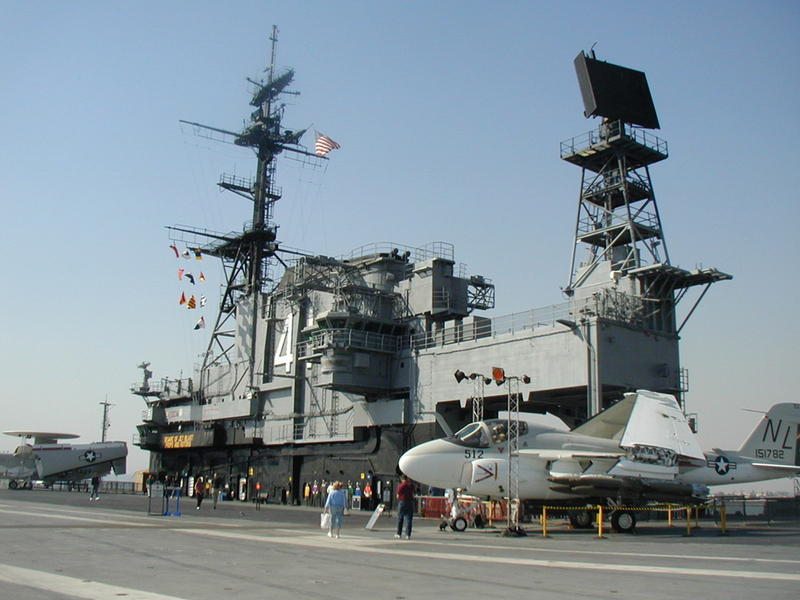 Midway was decommisioned in 1992, and is now permanently docked in San Diego as a museum. I recently had an opportunity to tour the museum and some of the picture I took are presented here. 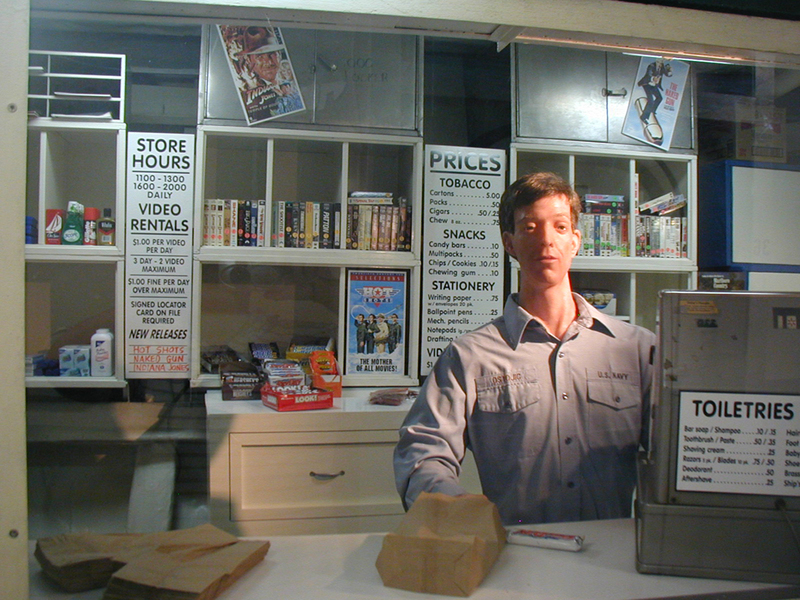 The Museum features a self-guided tour. Upon entering, you're given a device similar to an mp3 player. Yellow placards around the ship display numbers corresponding to the tour stops. You key the number into the device and it plays a description of the area. 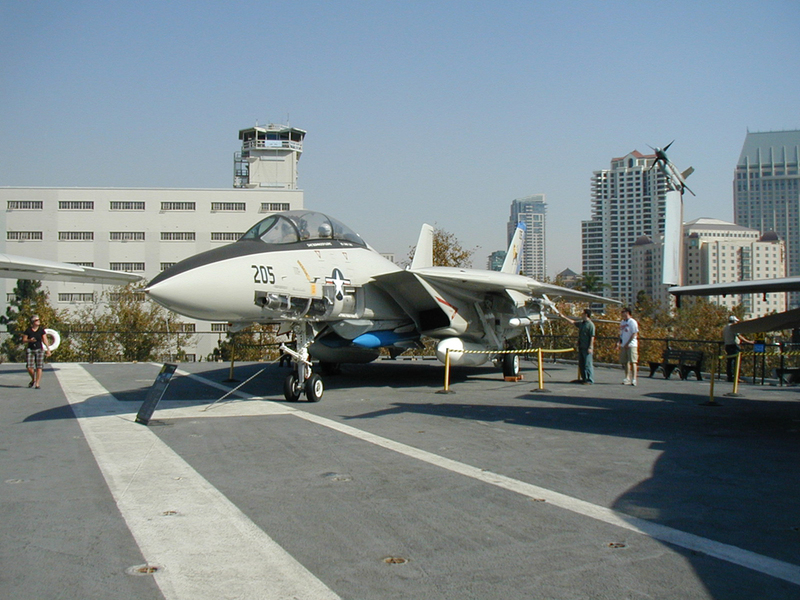 Some of the descriptions feature comments from former crew-members describing their duties or telling anecdotes about life on a carrier. The result feels more like watching a documentary than than the typical museum tour that involves following some bored guide around as they recite their script for the 100th time. 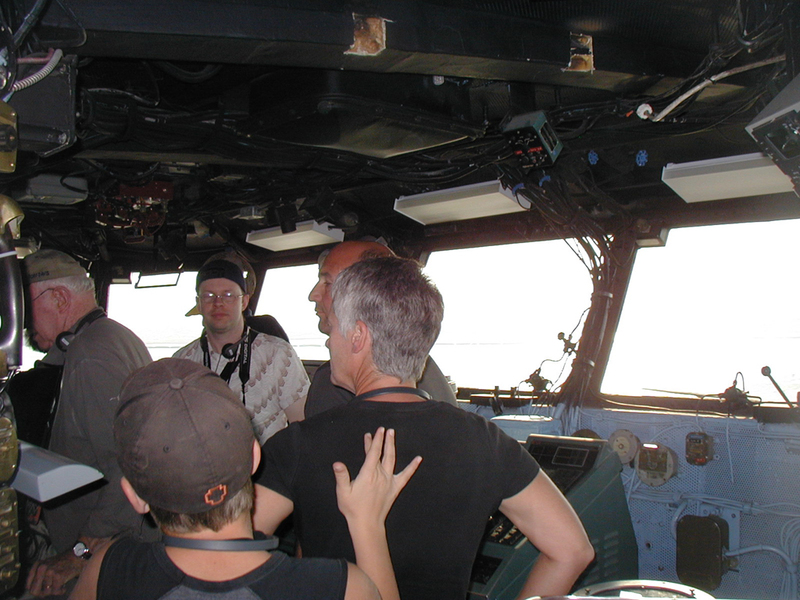 The flight-ops and bridge area are not part of the self-guided tour, you are guided through these areas in groups by museum personnel. As a result, you have limited time here and it can be a bit crowded. I found the museum fascinating and I highly recommend it as a stop if you happen to be in the San Diego area. 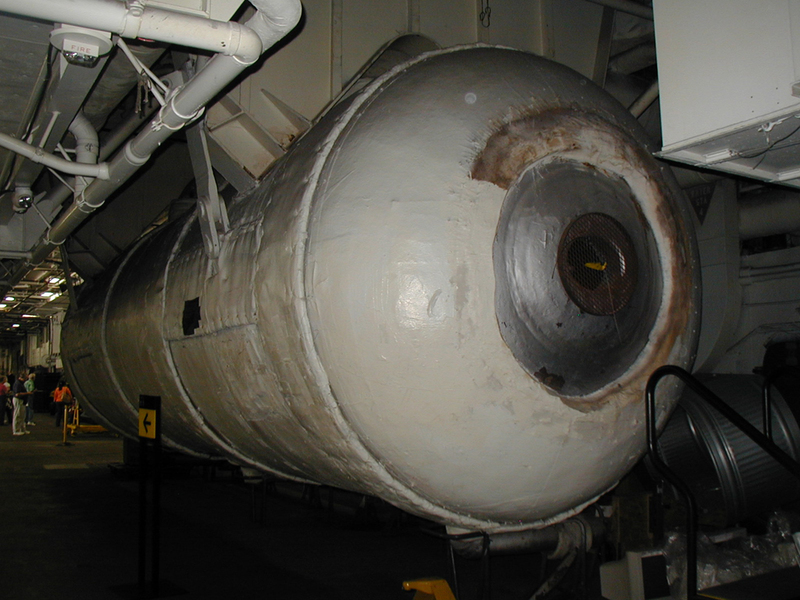 More information about the ship and the museum is available at the official museum website. View from the pier. The museum entrance is the scaffold on the right, the exit is the one on the left (next to the museum shop naturally). 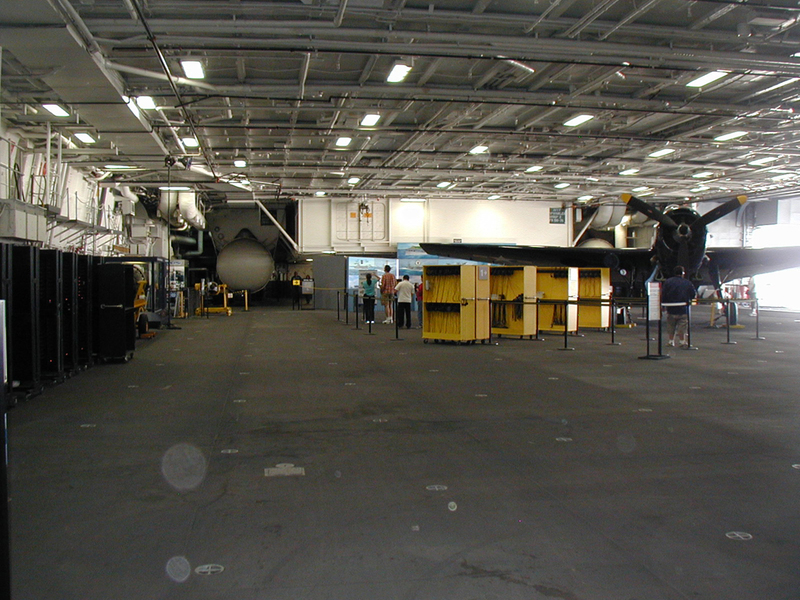 Both at hanger deck level. 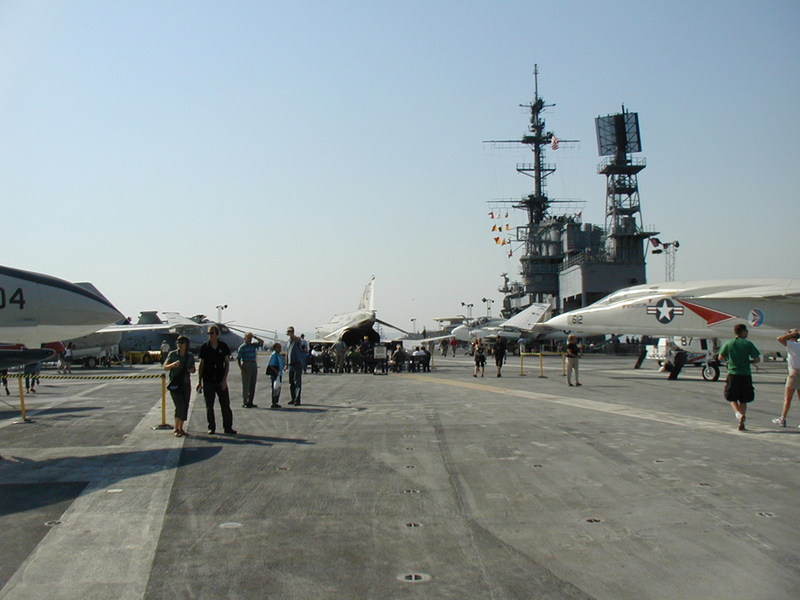 On the hanger deck across from the entrance looking forward. The yellow cabinets are where you pickup your virtual tour guide. The aircraft is a TBM Avenger. The round cylindrical thing to the left center in the distance is one of the steam recovery units for the forward catapults. One of the first things you see upon entering is this TBM Avenger. 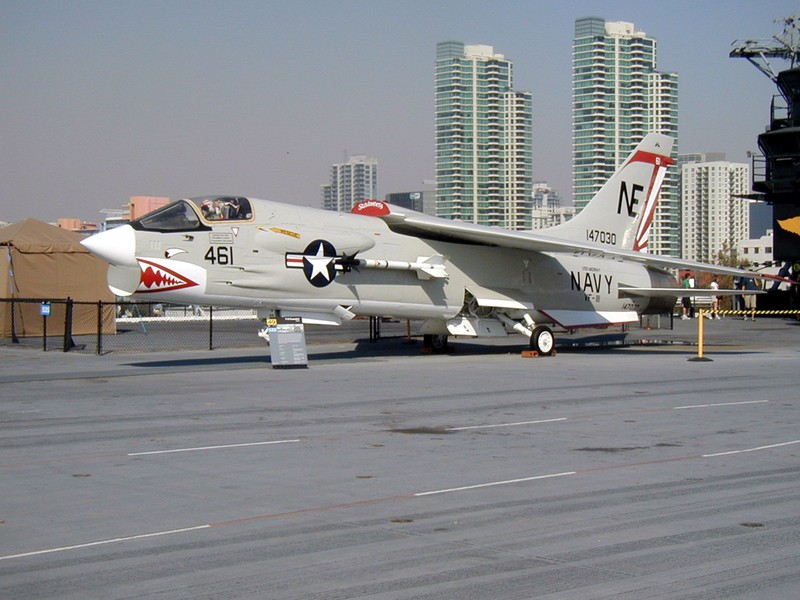 The museum includes most of the aircraft that served on Midway during her career. 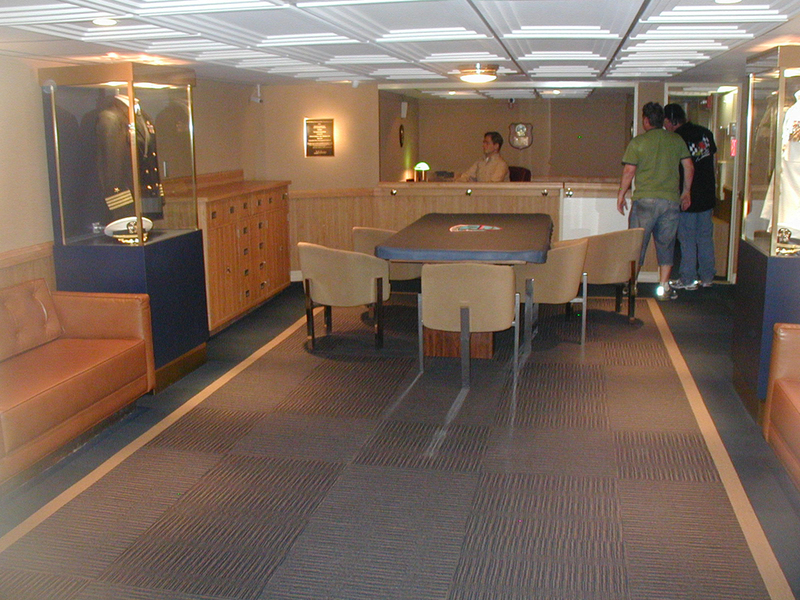 One of the Ship's Exchanges. 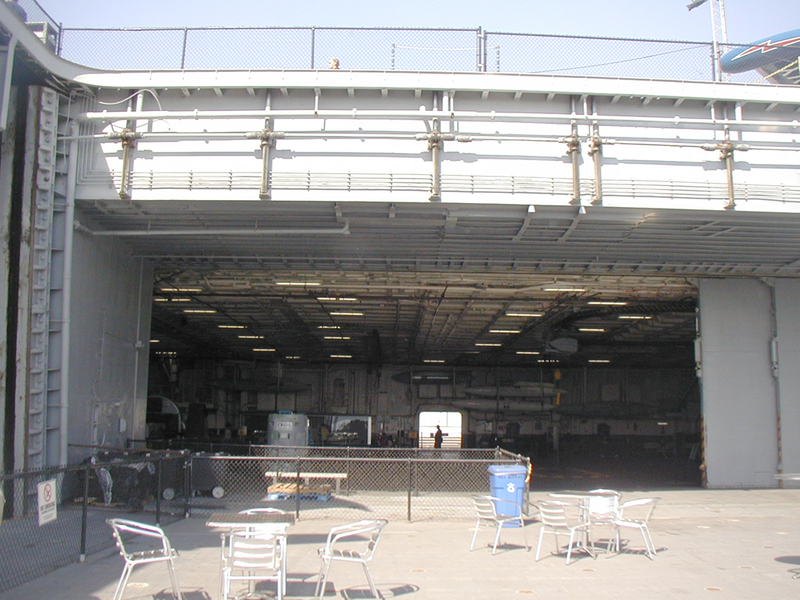 This one is just forward of the hanger near the enlisted bunks. Enlisted berths. There's no door to this area, it just between two corridors under the forward catapults. 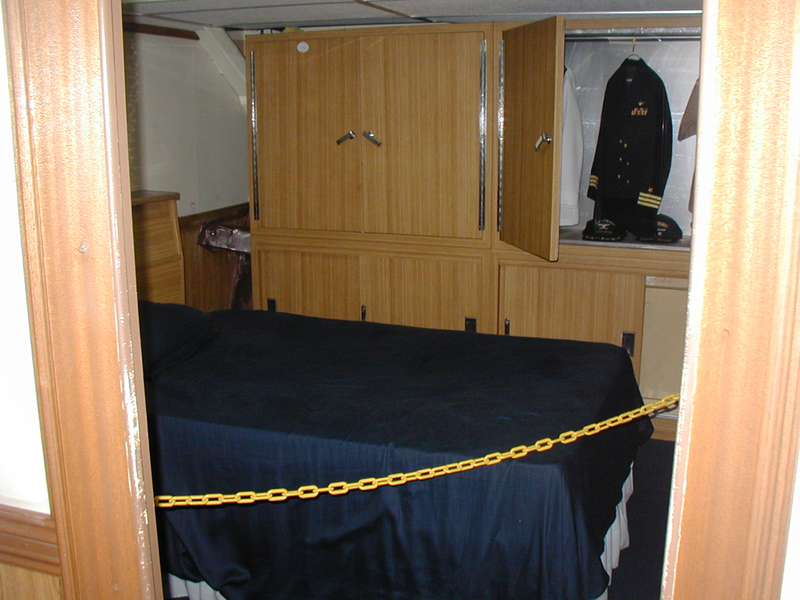 In addition to the small lockers, the berth hinges upward and there is additional stowage under what passes for a mattress (still, it beats a foxhole). 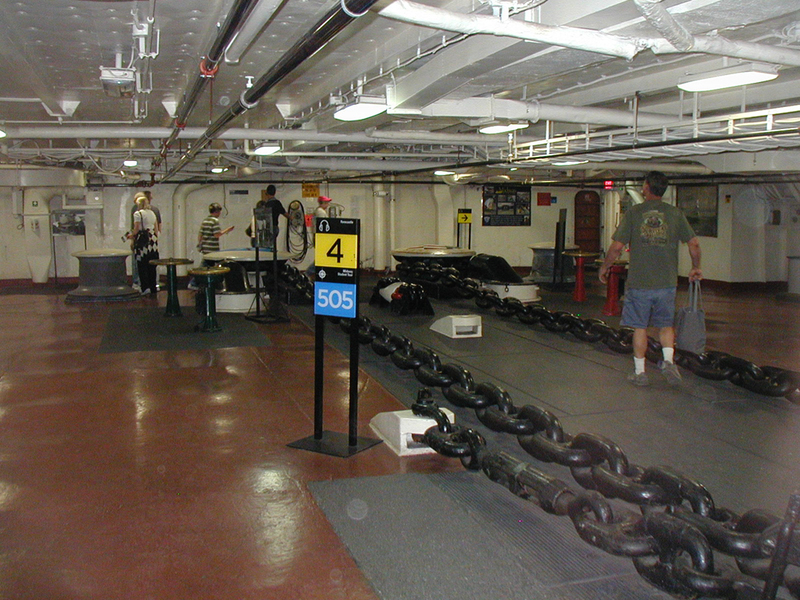 The forward anchor chain room. This is just forward of the enlisted berths. The yellow sign with the 4 is an example of the "tour stop" placards. Note the red tile. Most of the ship's decks are covered with this. When the tile turns green, you've entered "Officer Country". 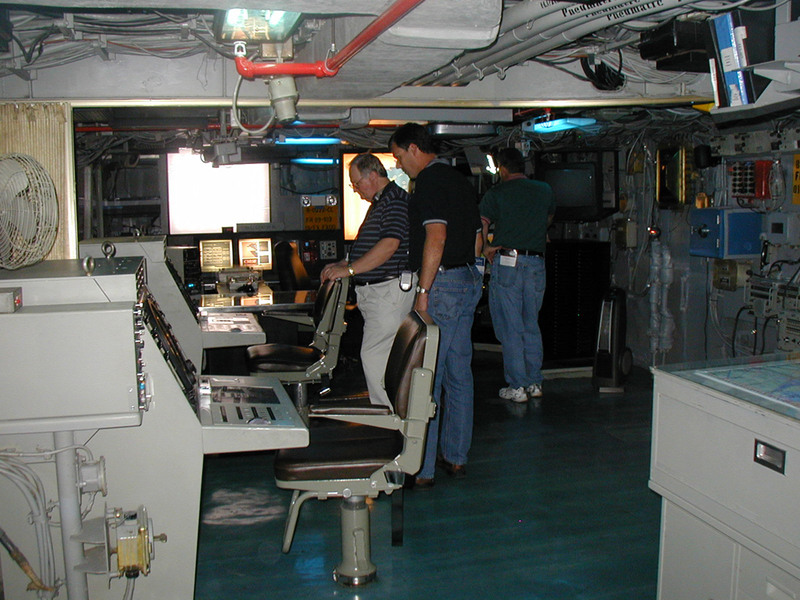 Blue tile is used for the Admiral's command area. 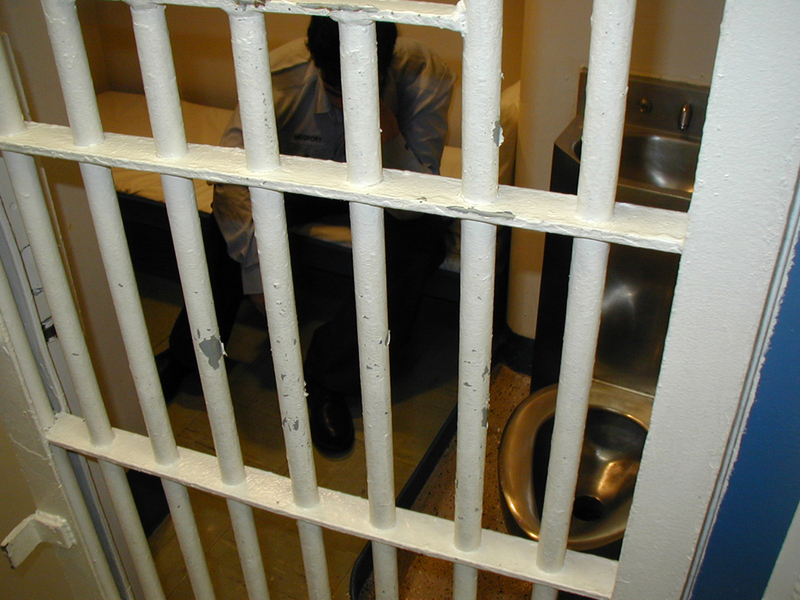 Junior Officer's Quarters. Hardly luxurious, but a step up from the non-coms. At least it's a real mattress. 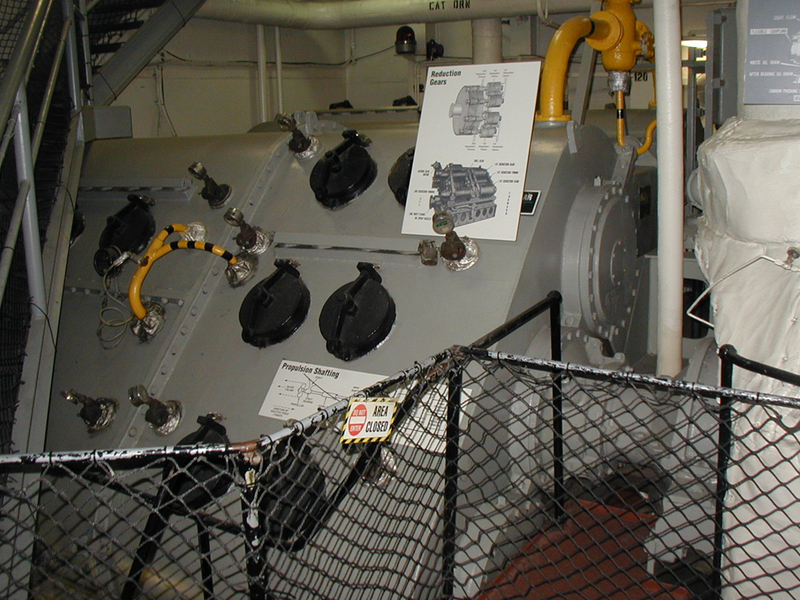 The steam recovery unit for the port forward catapult. This is almost directly behind the berthing areas we just left. Imagine trying to sleep with aircraft being catapulted off the decks only a few feet over your head. 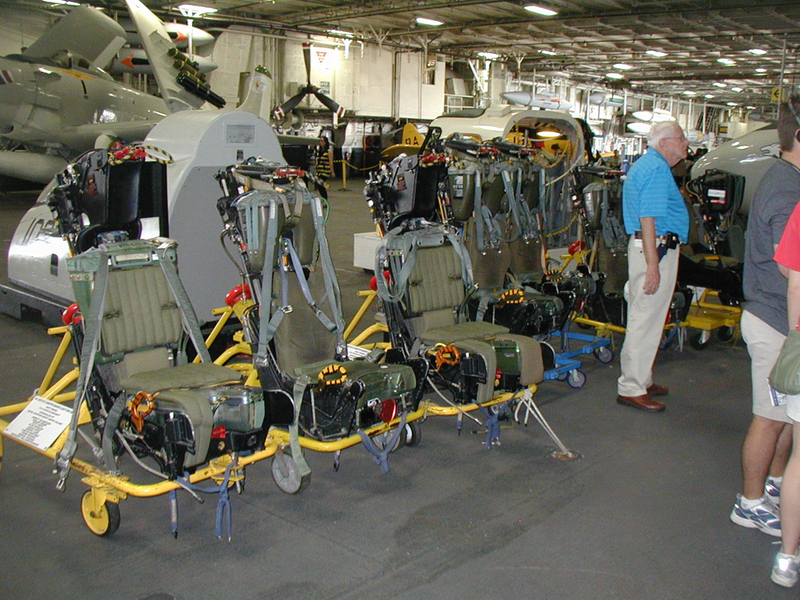 The hanger deck is full of displays such as this set of ejection seats used by the ship's various aircraft. 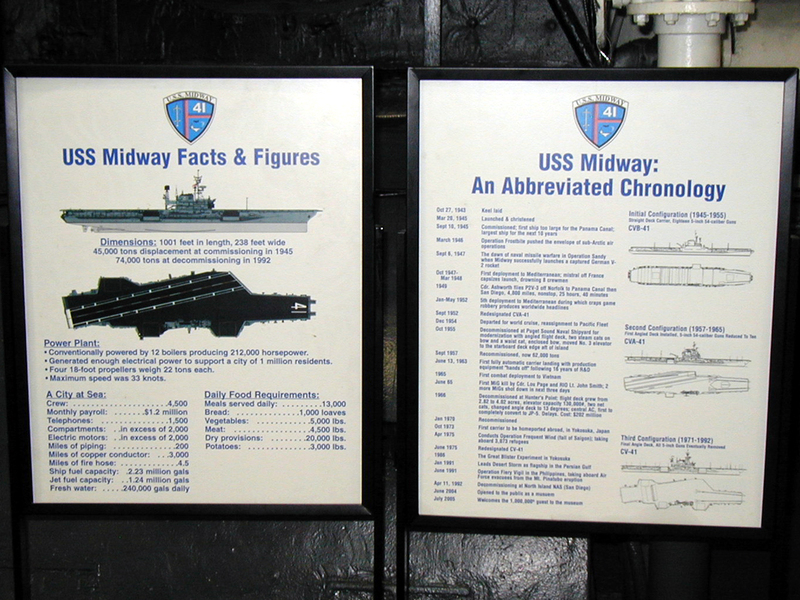 There are also lots of signs and placards giving details about the ship and its history. 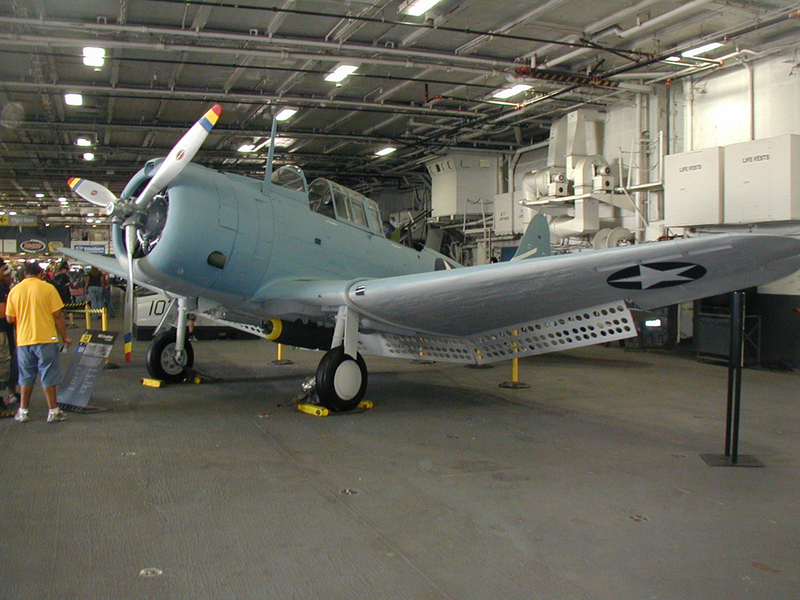 An SBD Dauntless. 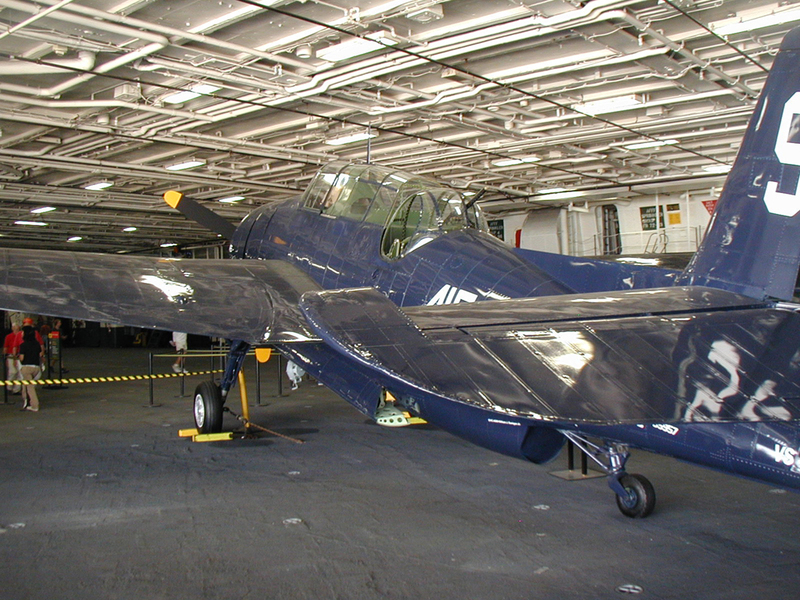 This example is not painted as a member of the Midway's air wing, but rather as one that participated in the Battle of Midway for which the ship is named. 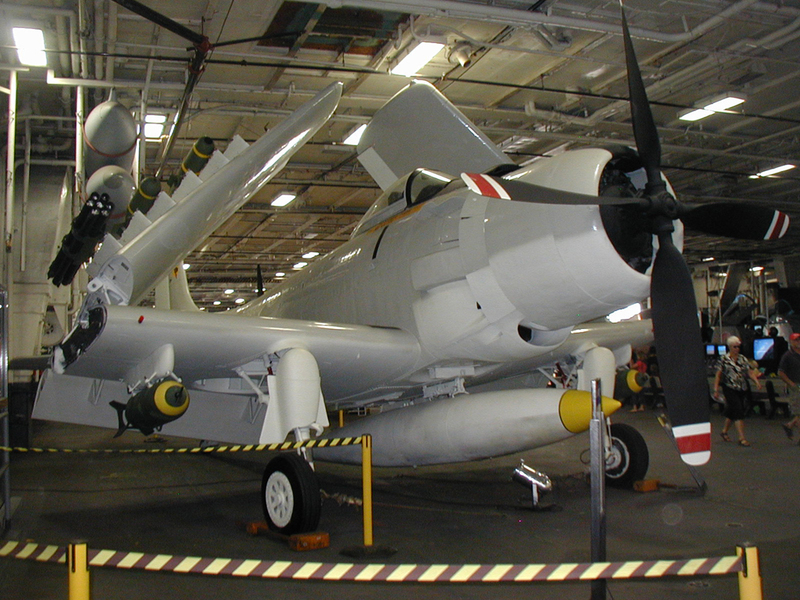 An A1 Skyraider in Vietnam era colors. 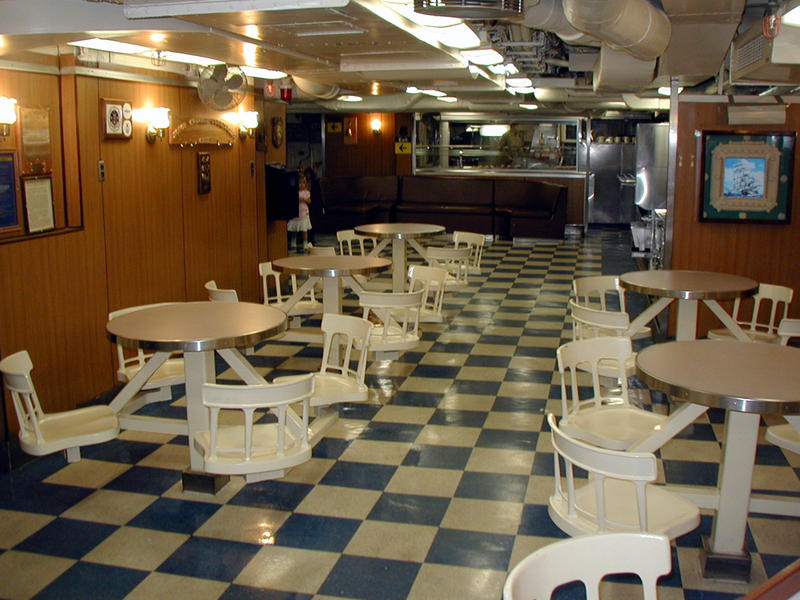 The view from the port aft elevator (which doubles as the seating area for the snackbar). 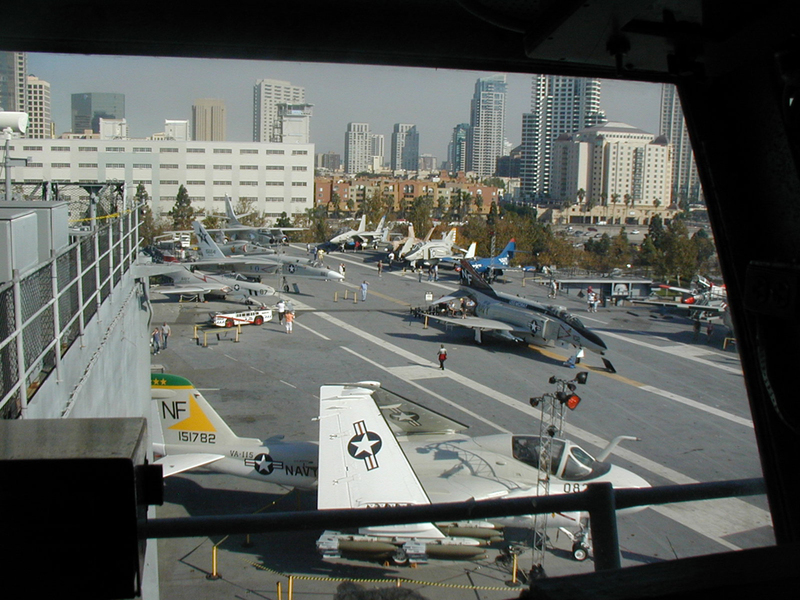 Midway is docked directly across the bay from the Coronado Island Naval Base and the harbour is easily visible from the ship. This is the U.S.S. 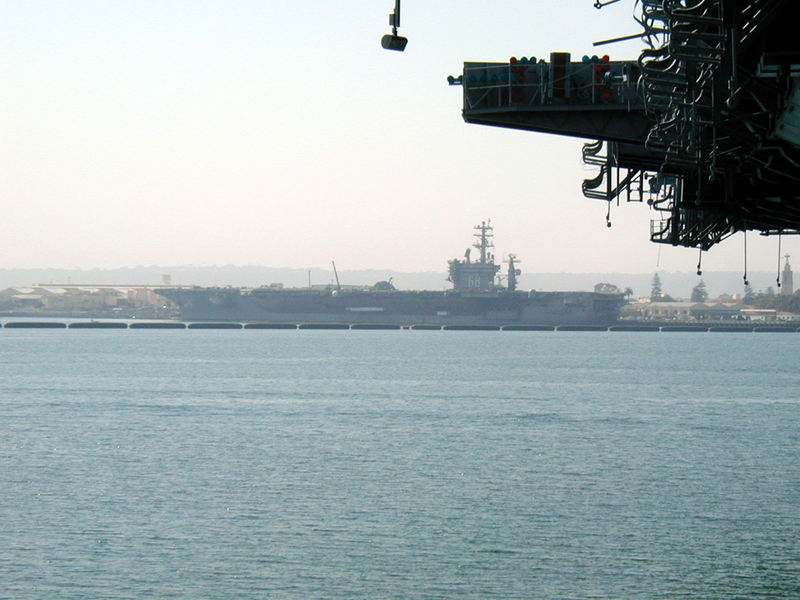 Nimitz in port. From the hanger you proceed below. 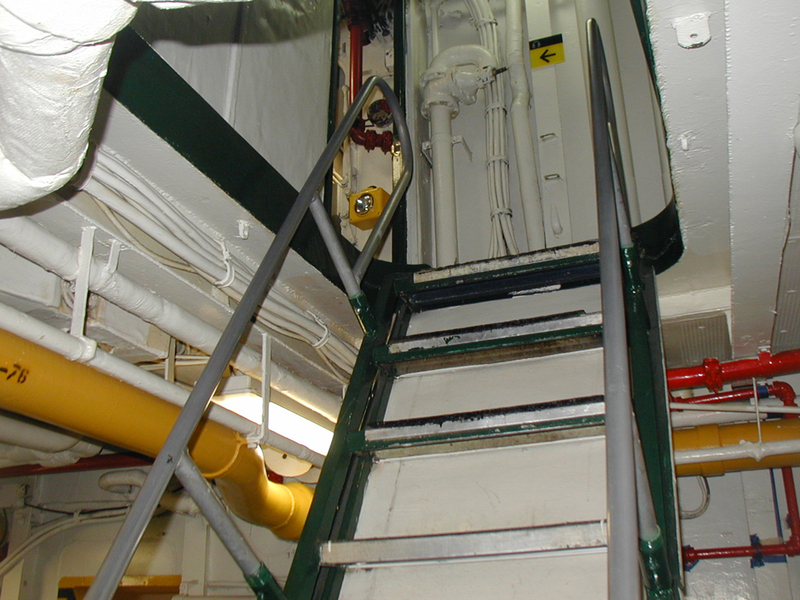 This is a typical gangway. Steep and rickety, they're designed to be pulled up and sealed in case flooding or fire makes it necessary to seal off certain areas. 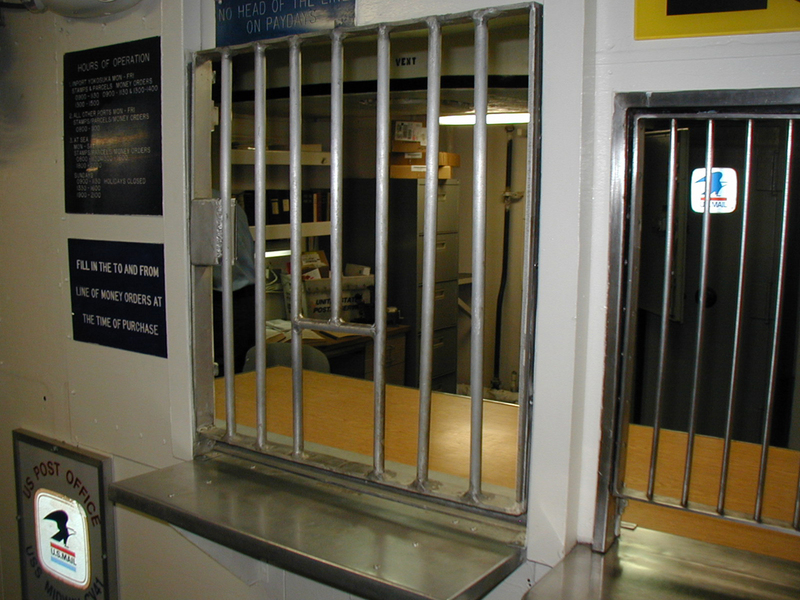 A typical cell in the brig area. A typical corridor. 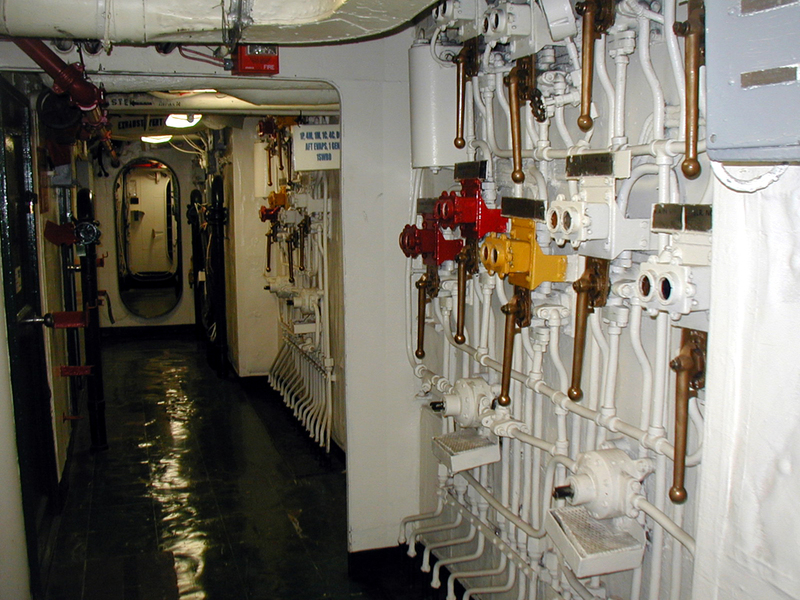 Steam and electical valves and switches are seen frequently in corridors like this. Engineering control. This is where the boilers, turbines, engines, and other equipment are monitored. The throttle board. Engines commands sent from the bridge appear on repeaters here where the engines are actually controlled. Part of the propeller shaft reduction gearing. 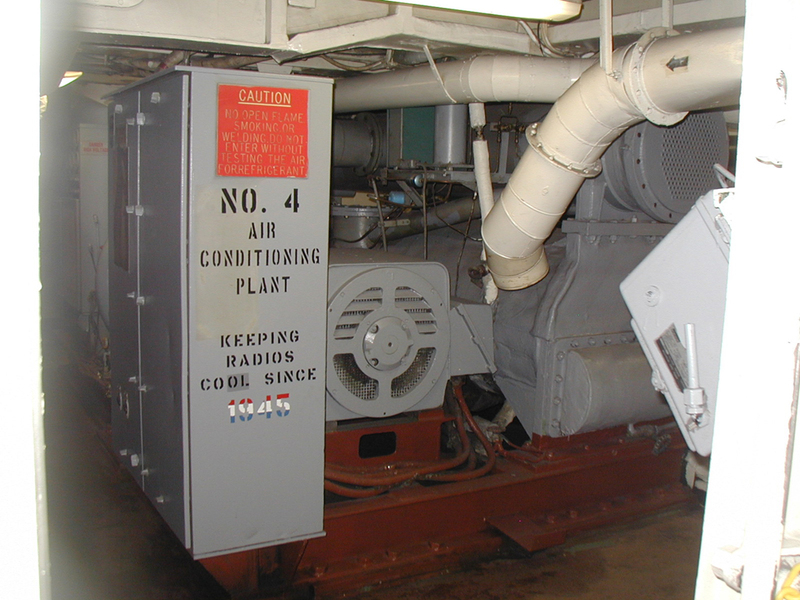 One of the air conditioning units. Senior officers quarters. In this case the ship's chaplains. 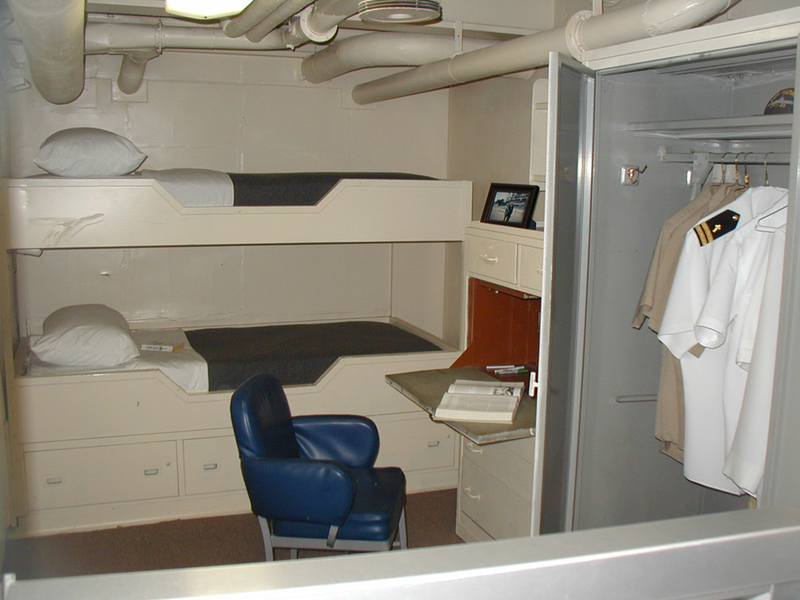 While the bunks aren't much different from the Junior Officer's, the room is semi-private and in a much quieter part of the ship. The XO's suite. 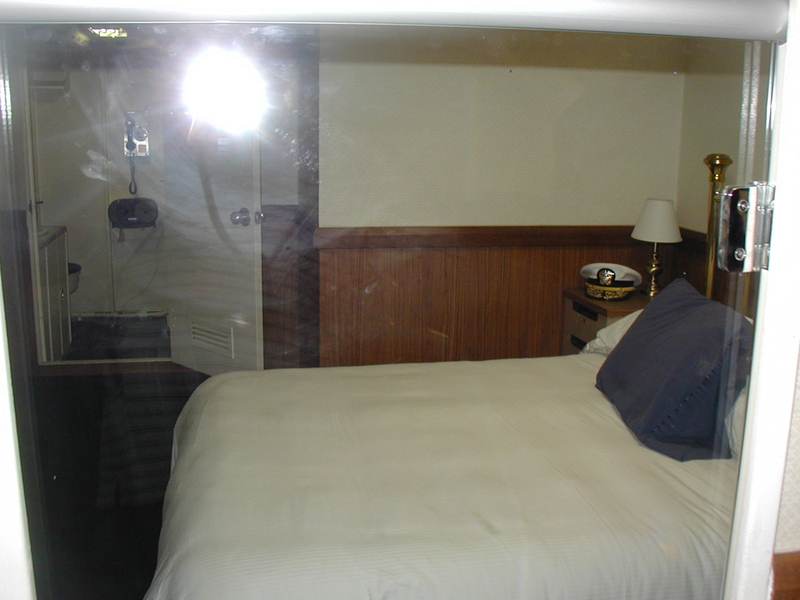 The Executive Officer has one of the few private rooms on the ship. XO's bunk. 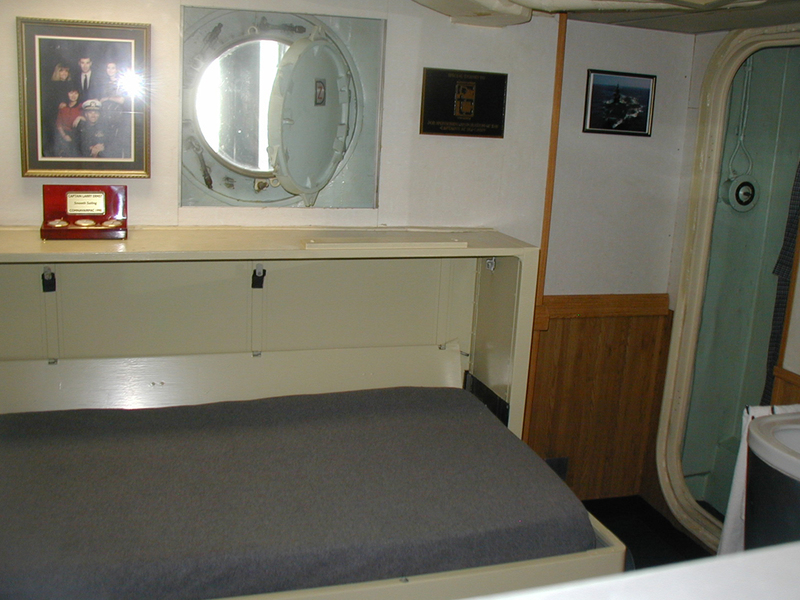 The suite also has a private head (bathroom) and small galley. The mess hall. This is the enlisted chow line. The mess hall is open 24hrs so the men can eat anytime they're off duty. 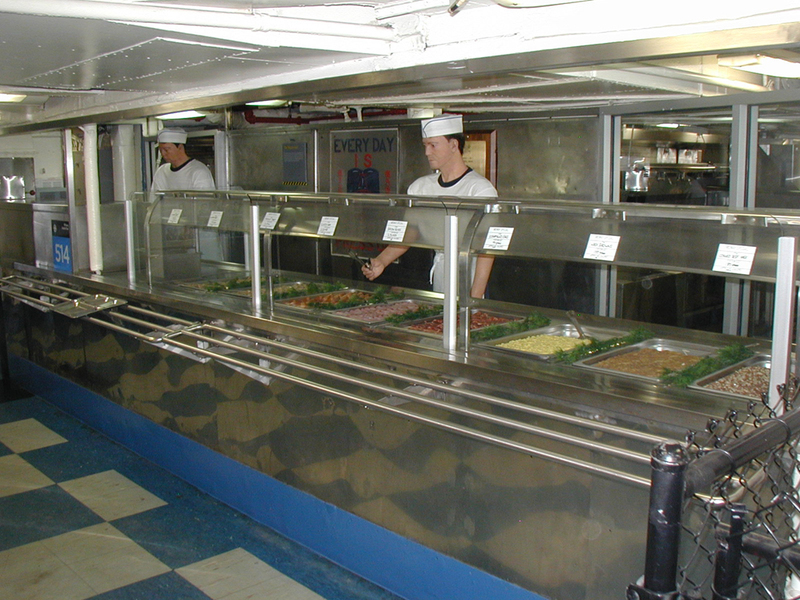 Part of the ship's galley where meals are prepared daily for the entire ship's complement. 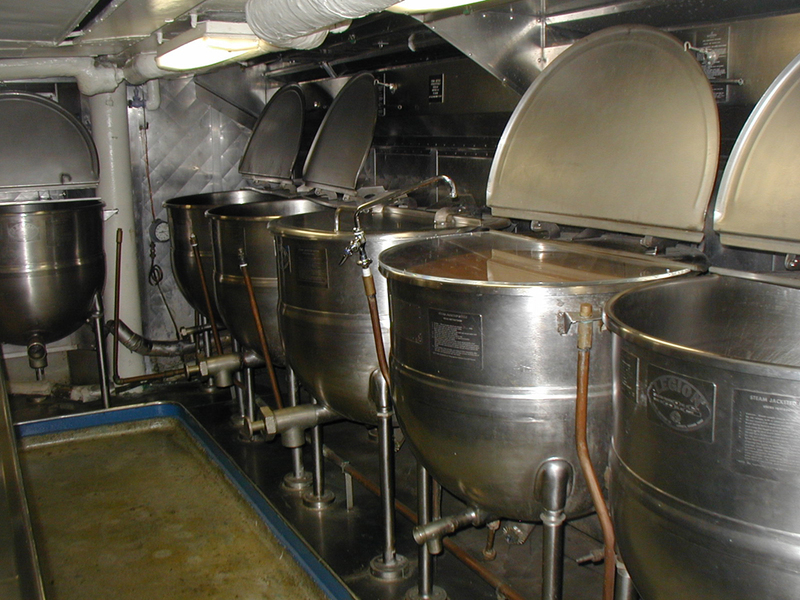 These are the kettles you use if you need to make enough soup for an entire aircraft carrier. 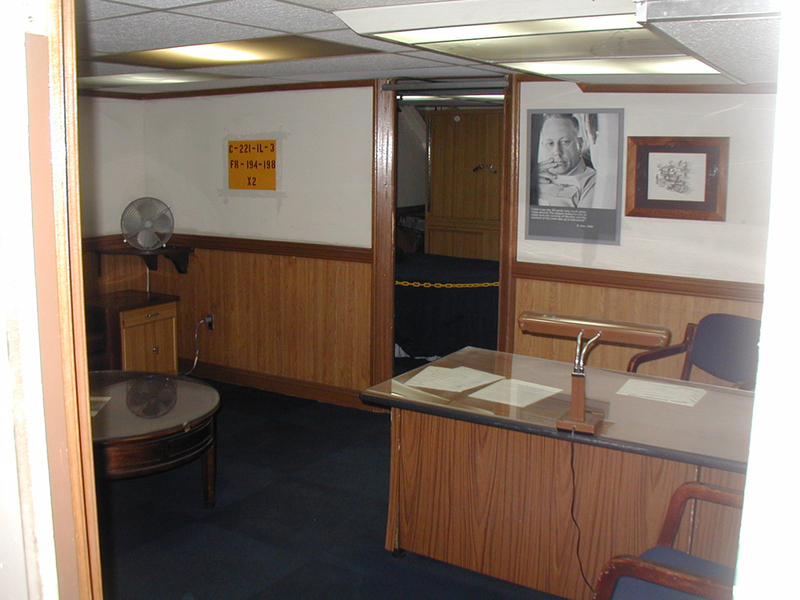 The chief petty officer's wardroom. This is senior NCO territory - the guys who REALLY run the ship. Even the captain will not enter the area without the permission of the chiefs! 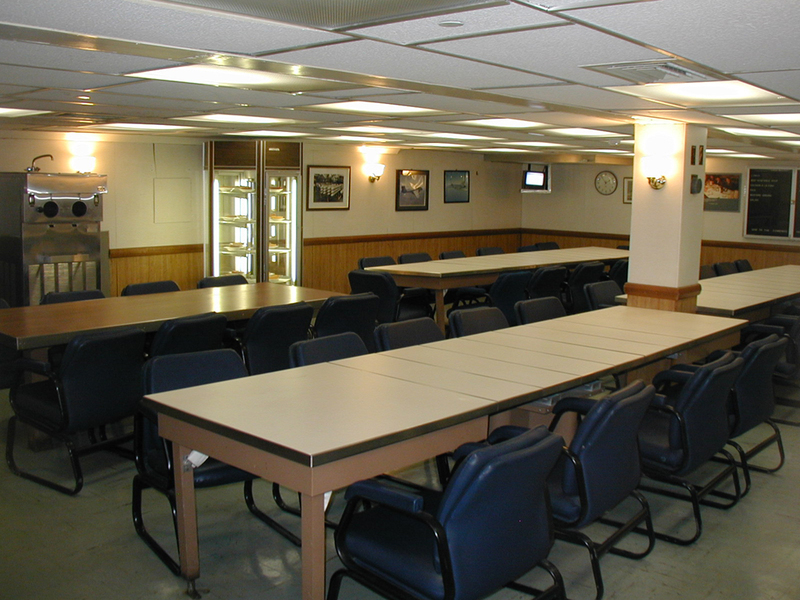 The officer's wardroom. 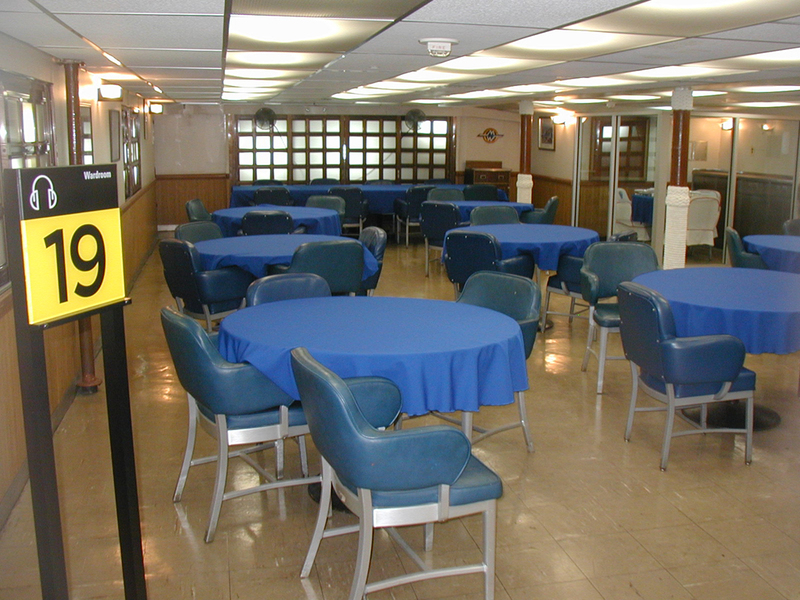 This is the formal dining hall for the ship's officers. Dress uniform is required. 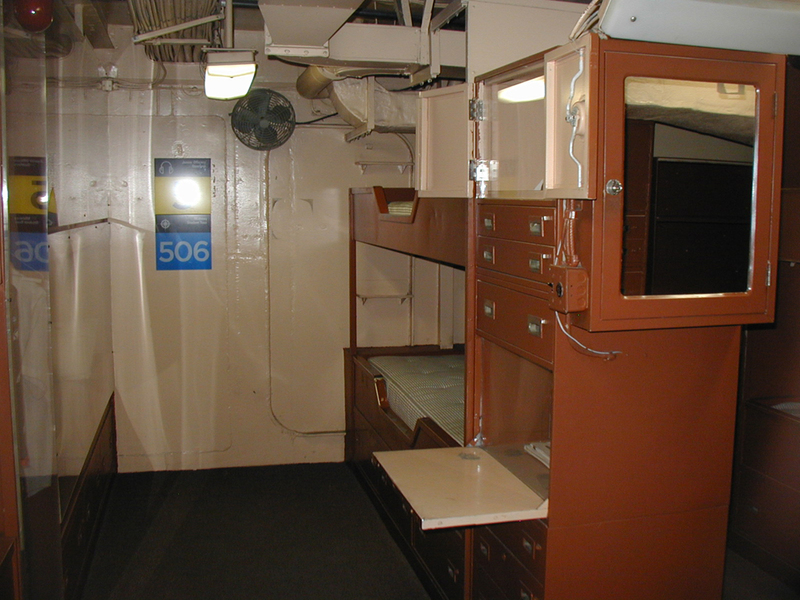 The "dirty shirts" wardroom. This is the officer's casual, cafeteria style mess. Frequently used by the pilots who are on ready alert. The officer's barbershop - complete with hair on the floor. No appointment required. Some of the presses in the ship's laundry. 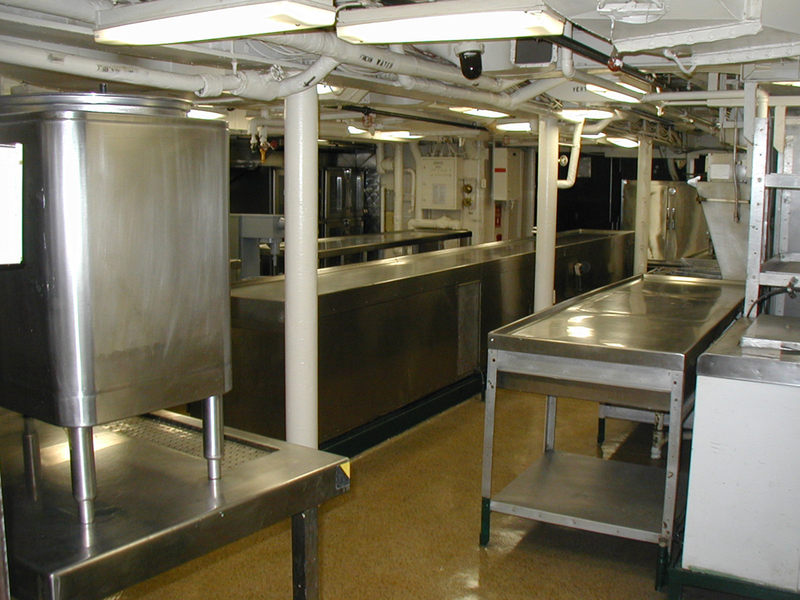 The ship's laundry handles cleaning and mending for the entire crew. Sick bay waiting room. Intensive care is to the right. 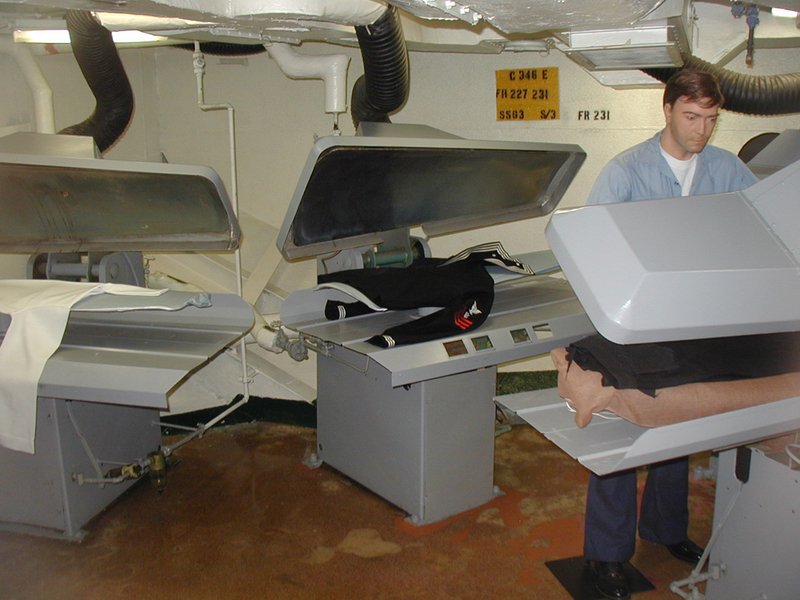 The regular patient bunks can be seen behind the chairs on the left. 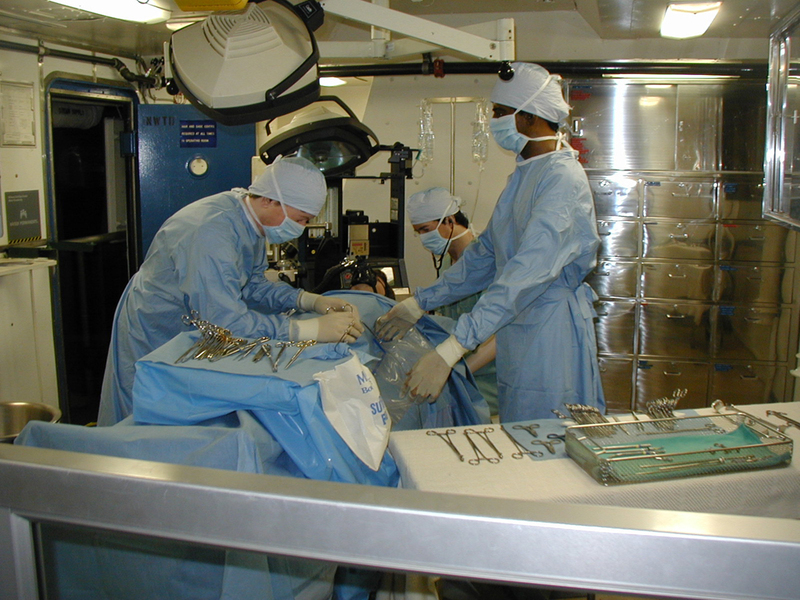 This is one of Midway's two fully equipped operating rooms. Sickbay is equipped to handle almost any type of medical emergency. Like any city, Midway has her own US Postoffice. This one is even open on Sundays when the ship is at sea. 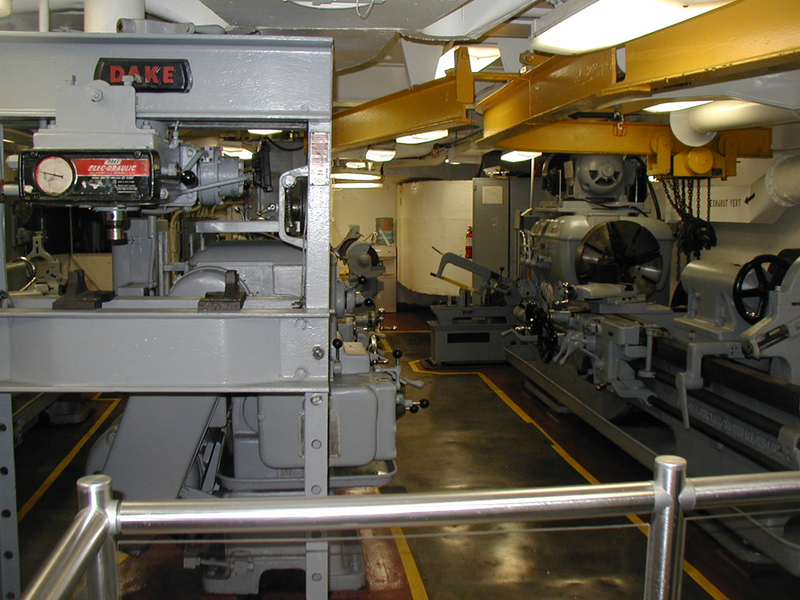 Carrying spare parts for everything that might fail at sea is impractical, so Midway has her own fully equipped machine shop that can fabricate almost any part that might be needed to keep the ship and her aircraft operational. The island with an A6 Intruder. The "meatball" is a visual glideslope indicator that shows the pilots (sorry, I meant aviators - the navy doesn't have pilots) when they're at the proper altitude on approach to the trap. An F8 Crusader lined up on the forward catapult. Most of the tour's descriptions of the aircraft include interviews with pilots describing their experiences flying combat missions from the Midway. 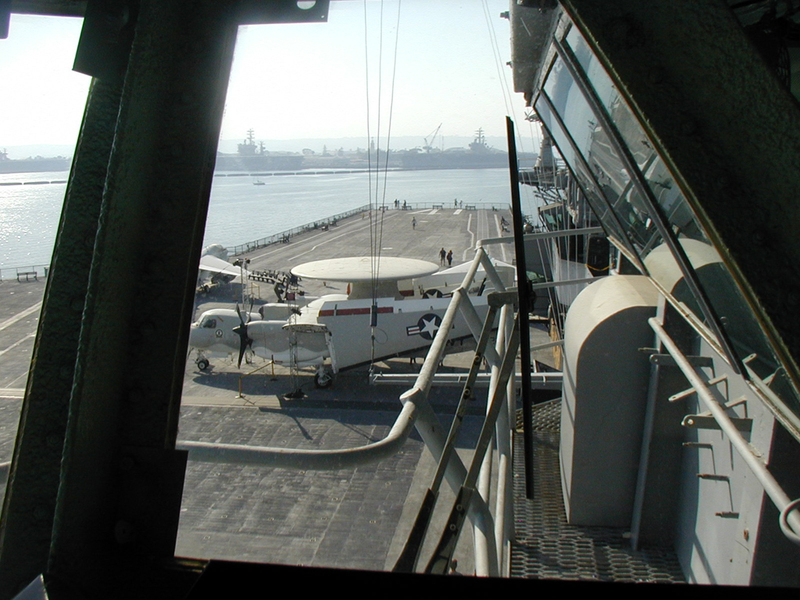 The view aft from the front of the flightdeck. 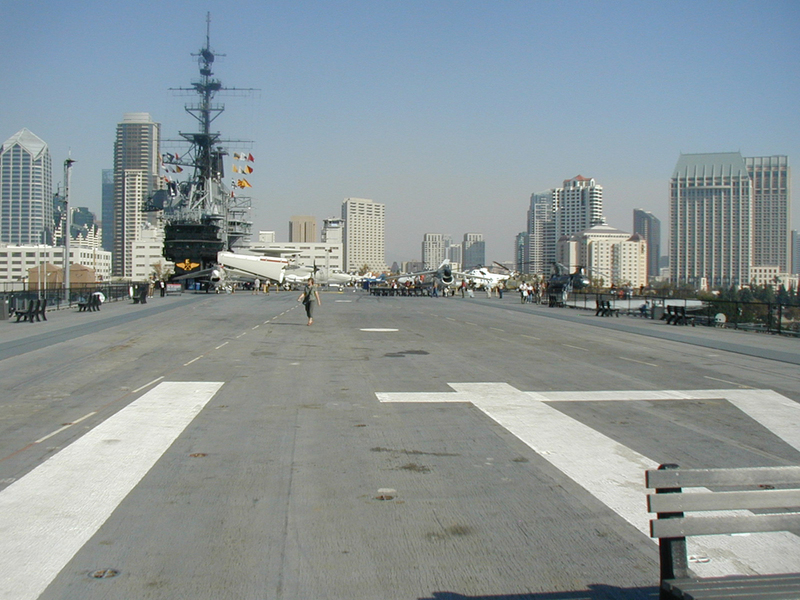 The F8 is on the starboard catapult and an A7 is on the port side. The bench is where Wayne and Garth sit during cat shots. 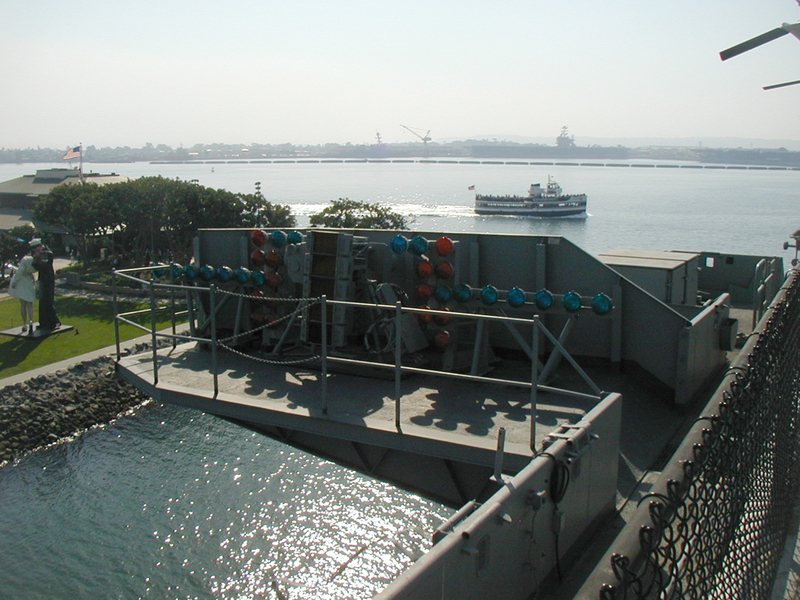 The bridge as seen from the starboard elevator sponson. Directly below the island is flag rank territory. 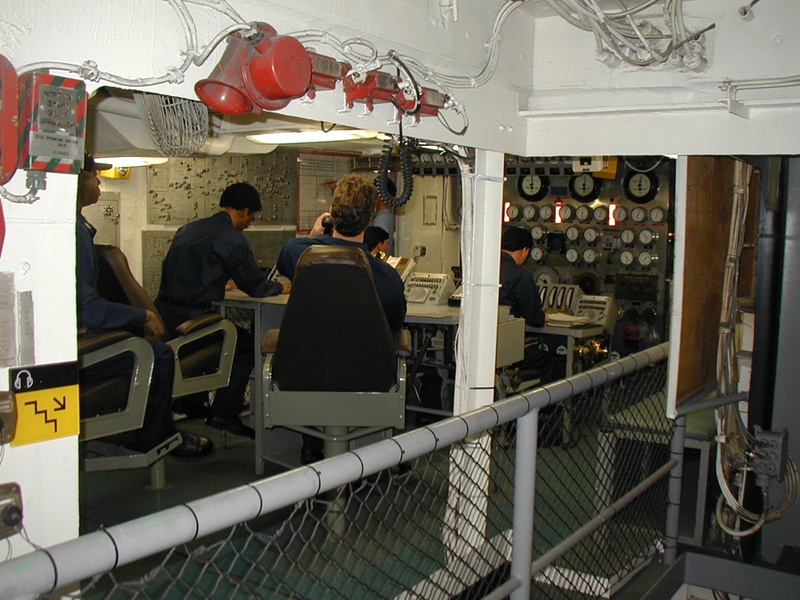 The Admiral commands the task force from this area of the ship. 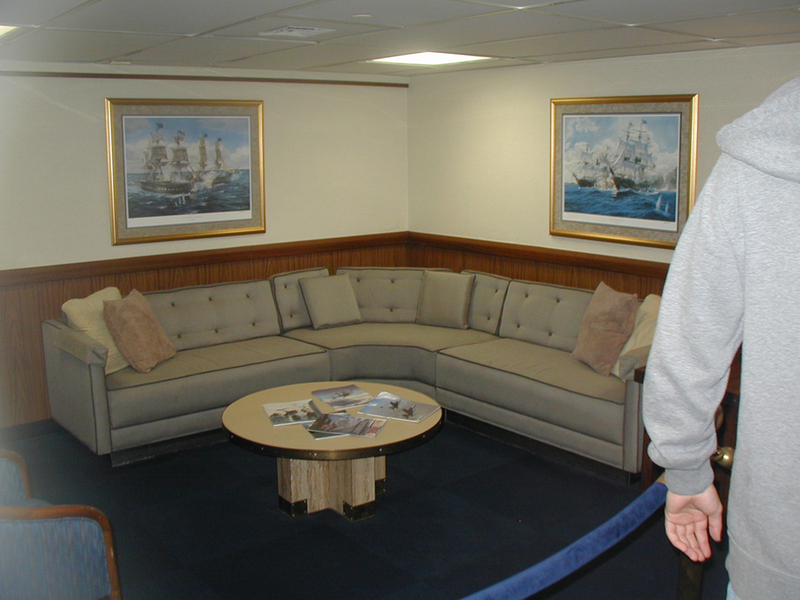 This is the admiral's lounge. 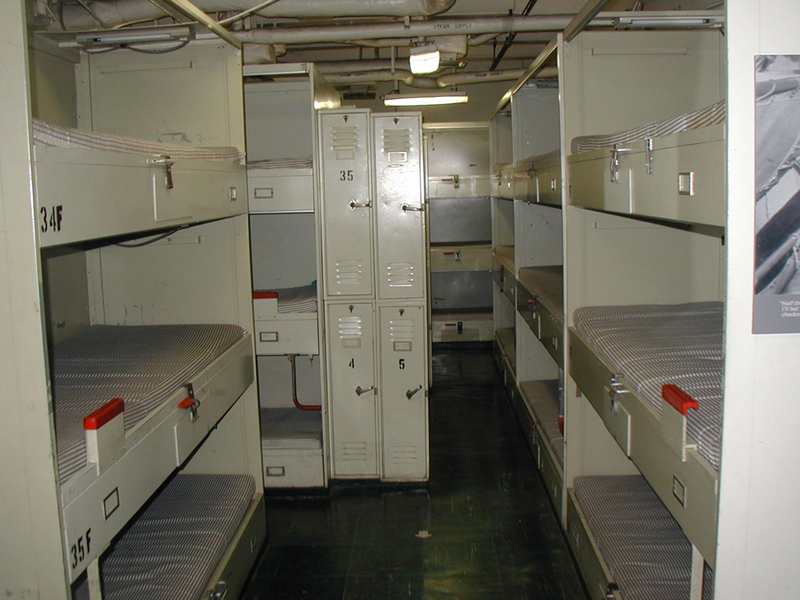 The Admiral's quarters. The Admiral has a private head and his own private mess with a personal cook. The map room. This is where missions are planned. 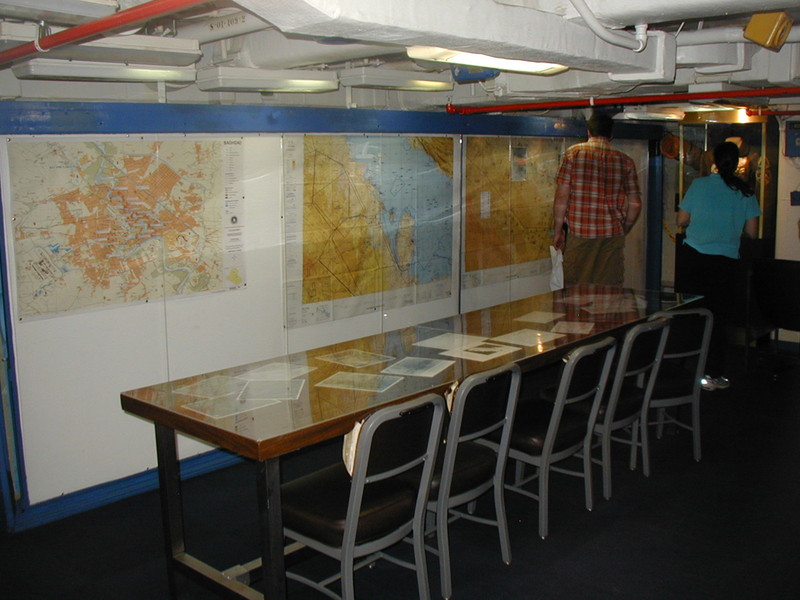 The maps are set up as they were during the opening of Desert Storm showing downtown Baghdad and the Persian Gulf. CIC. The Command Information Center. While the Captain commands the ship from the bridge, the Admiral commands the task force and strike missions from here. This flash lit photo makes the room appear much brighter than it really is. In reality it's like being in a movie theater. Another view of the CIC. This one looking back the other direction. The monitor on the wall is playing a tape of CNN's coverage of the initial attack on Baghdad during Desert Storm. Aircraft from Midway participated in those attacks. CIC again. 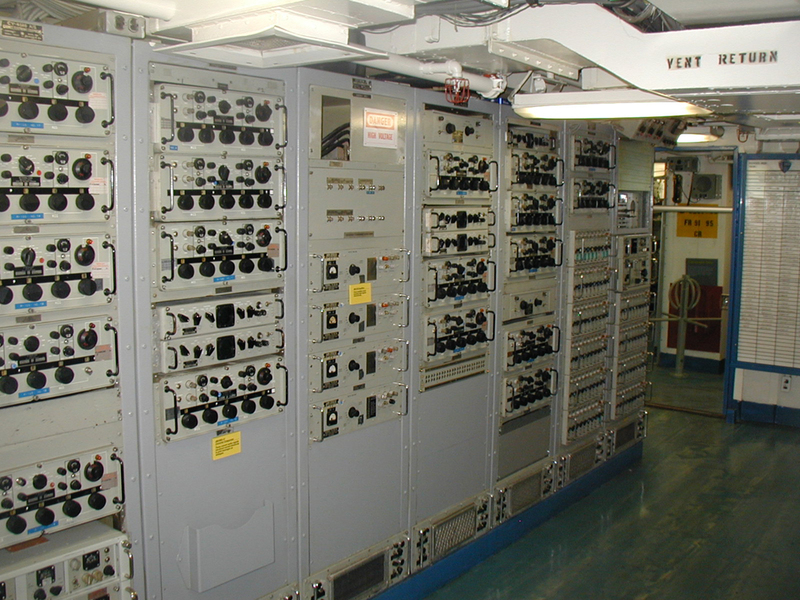 This is one of the radar operator consoles. 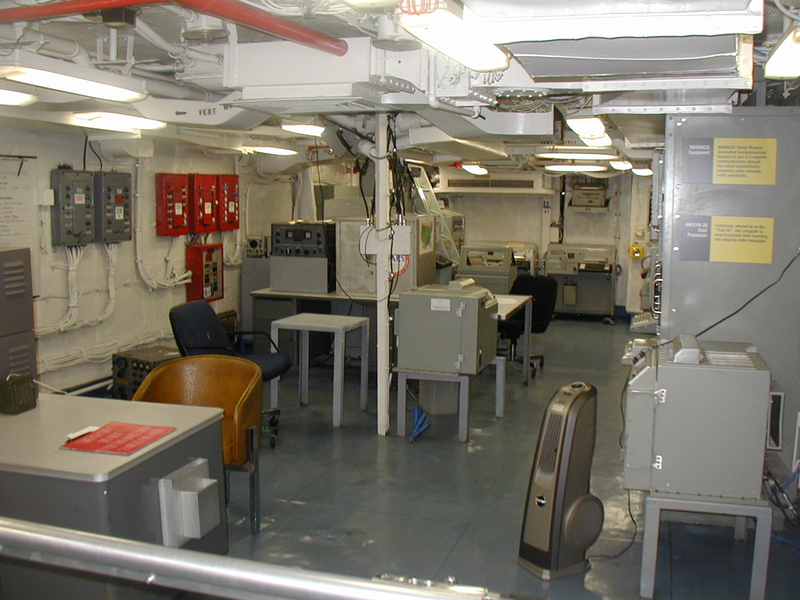 Just off of the CIC is the communications room. This is where the admiral communicates with the task force and with fleet headquarters. Flight Ops. 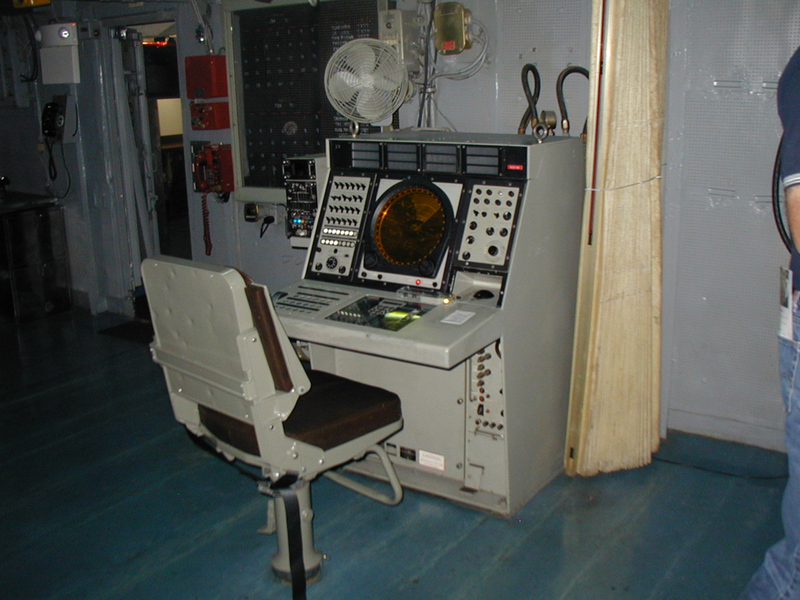 This is the "control tower" for the ship and is where the "air boss" controls launches and traps. This is the view aft from the air boss' s seat. The forward view from the air boss station. Note the navy yard across the bay. Just forward of flight-ops is the bridge. Having had to attach myself to a group to get up here, it was rather crowded and this was the best shot I could get. The "con". This is where the ship is steered. 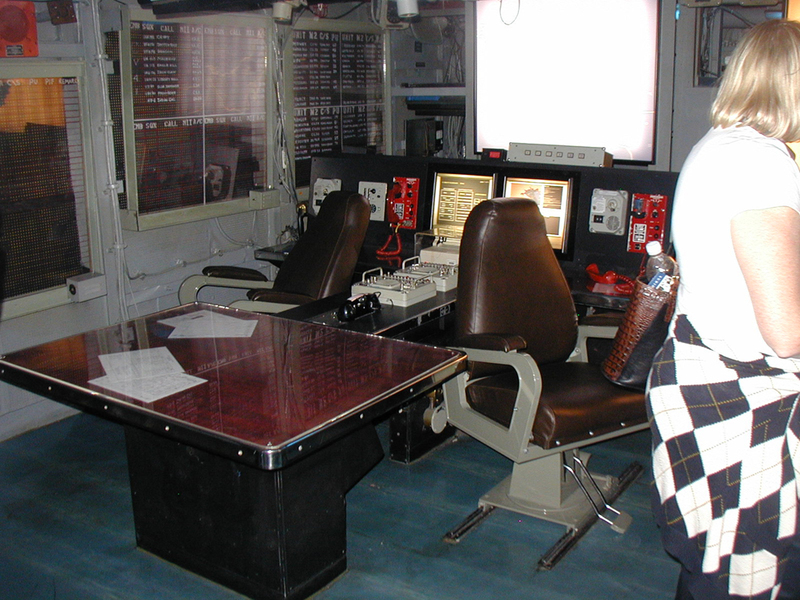 Commands from this console are sent to the control room where the rudders and engines are actually controllered. 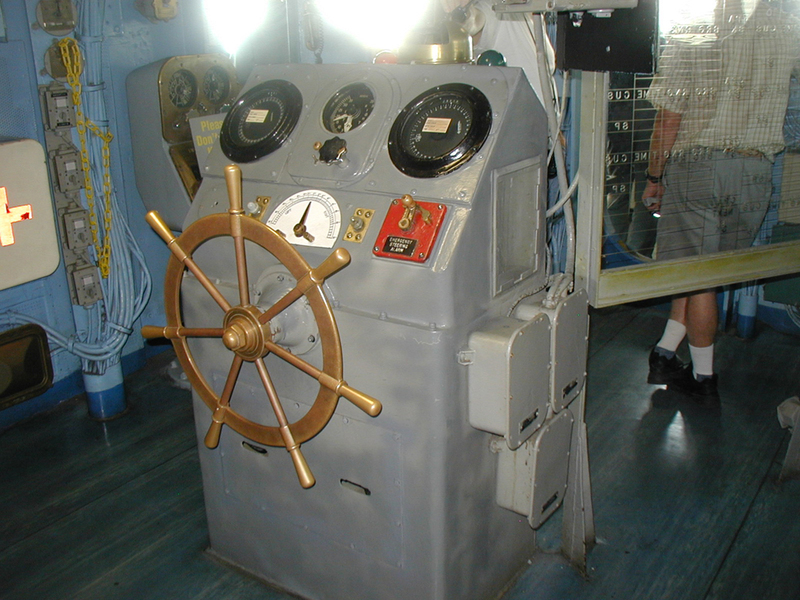 Course and speed are relayed to the con officer via the dials on the top of the console. 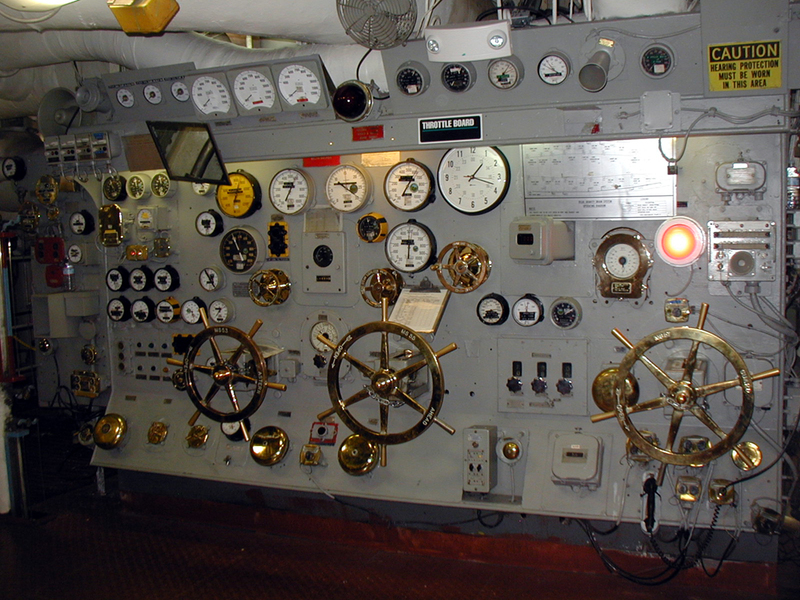 Engine speed is commanded from controls on the brass panel on the wall to the left. 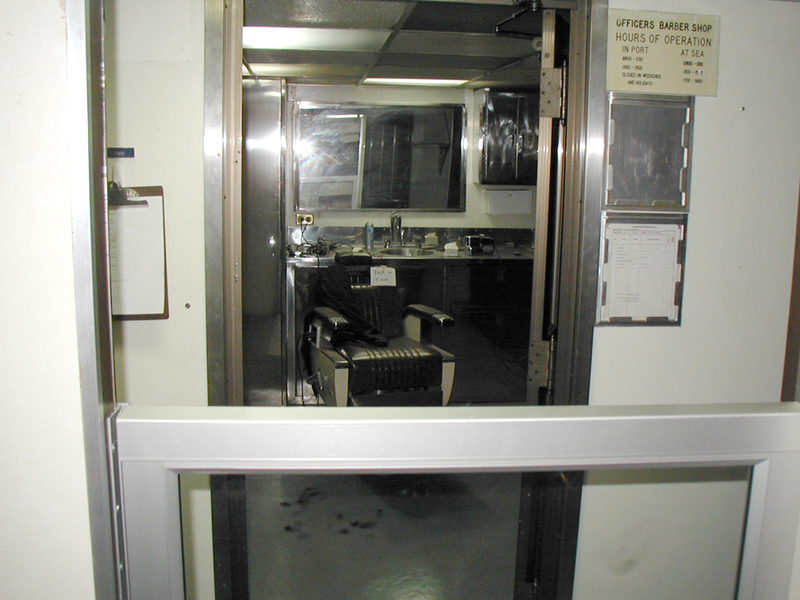 The captain's "ready room". 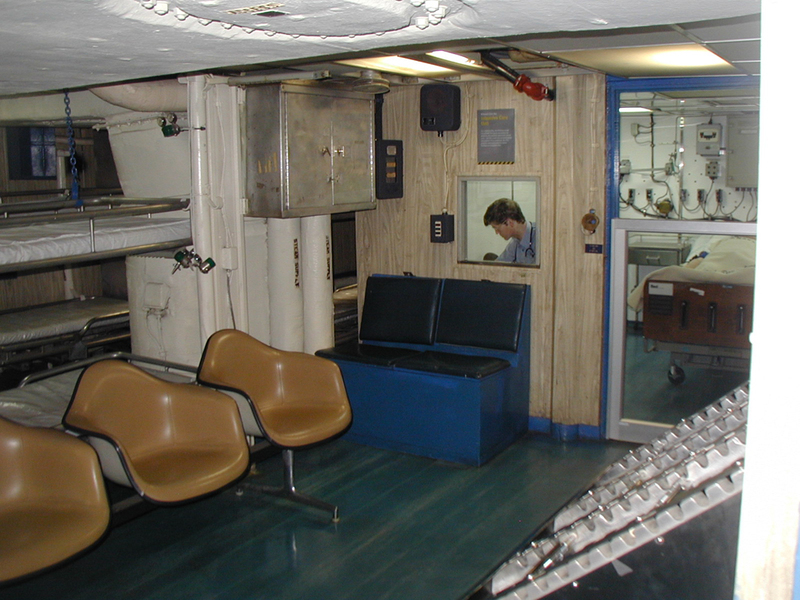 Just behind the bridge is a small office with fold down bunk where the captain can relax while remaining immediately available to the bridge if needed. 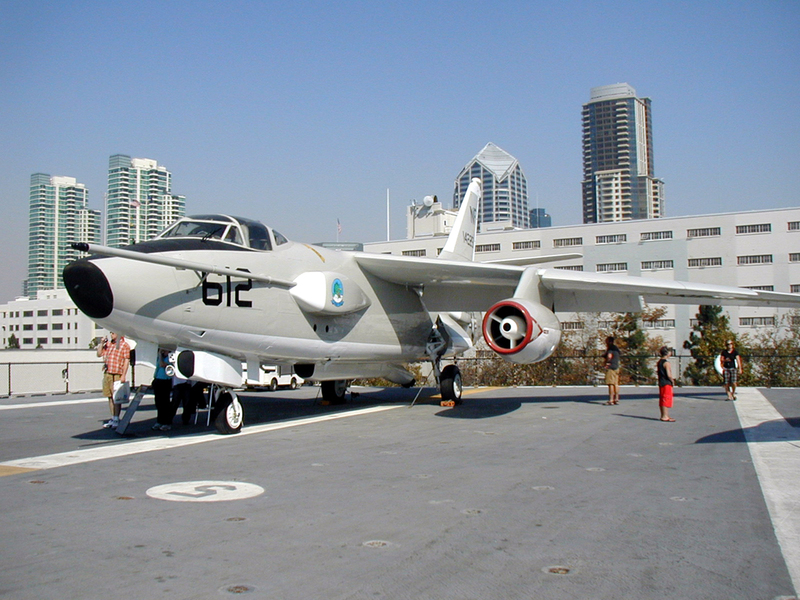 From the bridge it's back to the flight deck for more aircraft (like this A3 Skywarrior) before the tour ends with a trip to the gift shop.